GN Solids Control has provided many sets of large mud recycling systems to Asia clients. Just several days before, GN Solids Control finished the manufacturing of one set 1500 GPM mud system for one client in Hong Kong. GN Solids Control designs and manufactures various mud treating systems, from standard mud systems such as 200 GPM, 300 GPM, 500 GPM to 1000 GPM. Customized mud systems are also manufactured based on clients’ demands. This 1500 GPM mud is one turnkey solution for mud treating and recycling. In this system, there are two sets shale shakers, one set mud cleaners (with 3 sets 10 inch desander cyclones and 16 sets 4 inch desilter cyclones). All those shale shakers and mud cleaners are assembled on one mud tank. GN centrifugal pumps are also provided for provide the slurry into those two size cyclones. One separate mud compartment is used to mixing the clean mud with GN mud agitator. Sometimes, one GN jet mud mixer is also equipped on the mud treating and mixing system for adding new chemicals. GN control boxes are fixed on the mud tank skid, they are used to control the on and off of mud agitators and centrifugal pumps. One auxiliary ladder is also fixed for convenient work and easy maintenance. 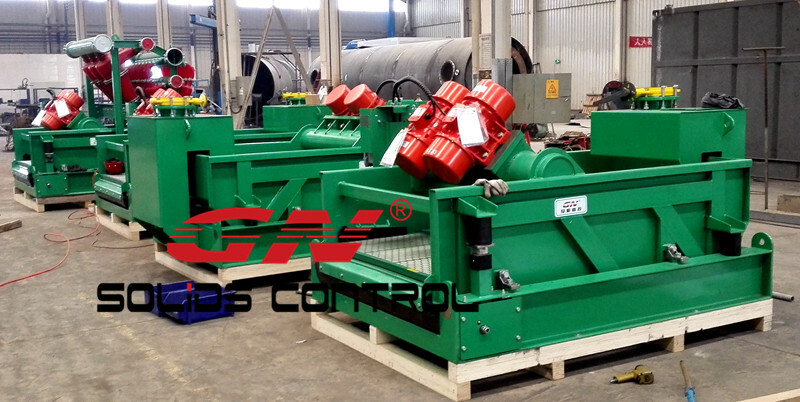 In recent years, GN Solids Control has been improving the solids control as well as drilling waste management systems. GN shakers have been already provided to working under various situations. While for the decanter centrifuge and cuttings dryer, GN engineers have also kept improving them from all aspects: improve equipment performance, and achieved good results. With more and more domestic and international customers are using GN Solids Control equipments, more and more well-known international oil and drilling companies have asked to provide GN Solids Control decanter centrifuge and cuttings dryer.